We regard Yourmapsnow.com as a browser hijacker because it changes your browser’s default search engine to its address without your permission, so we suggest that you remove it. This browser hijacker includes a browser extension for Google Chrome and Firefox that supposedly enables you to access maps, get driving directions and live traffic updates and more. However, this is just a clever marketing strategy, because this hijacker’s main purpose is to redirect you to its featured search engine. This search engine is likely to contain promotional links that make this hijacker’s owner’s money when you click them. We are of the opinion that at least some of its search results may be unreliable, and therefore, you ought to remove this hijacker from your system. We will begin our analysis by providing information regarding this hijacker’s distribution techniques. All three major browsers support this hijacker. It can either come as the aforementioned browser extension for Chrome and Firefox or as a dedicated program for Internet Explorer that controls the hijacking process and possibly provides protection against its removal. Now let us discuss how this program is distributed. You can get this browser hijacker from its dedicated website at Yourmapsnow.com/Maps? for all three web browsers. However, you may also come across it by browsing on the Chrome Web Store. You might think that all applications featured the Chrome Web Store are legitimate, but that is untrue. Also, we believe that it may come bundled with malicious software installers that can be featured on freeware hosting websites or promoted via adware programs. If Yourmapsnow.com comes bundled with other software, then it may be installed without your knowledge or approval. We are sure that the installer will not warn you that your browser’s homepage will be changed to Yourmapsnow.com. As far as its promoted functionality goes, we can say that this browser hijacker delivers on its promises. 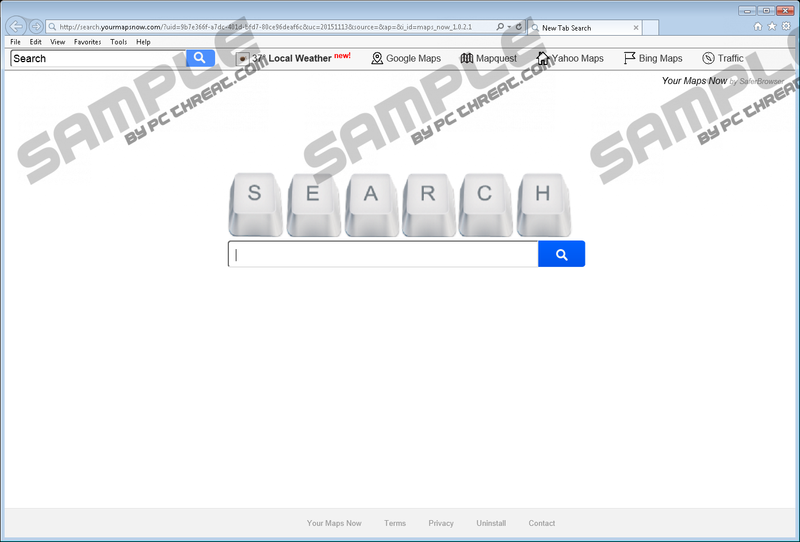 It features links to Google, Bing, Yahoo, and other maps in its custom browser-window-based toolbar that also features information about the weather and a search box. Its search engine should redirect all searches to Yahoo.com, but that is not always the case as in some instances your browser’s search engine will not be changed. The Yourmapsnow.com browser hijacker will tamper with your computer’s Windows Registry by adding malicious entries that you can delete manually, but it would be much easier to get rid of them by using an anti-malware scanner. Therefore, we recommend using SpyHunter, since it one of the few tools that can remove all malicious files and registry entries. Whichever approach you choose to use is completely up to you, but only an anti-malware scanner can delete this infection in its entirety without leaving any loose ends. Again, we urge you not to use Yourmapsnow.com, because it will not improve your browsing experience. All it does is redirects all searches to third-party websites. And, if you got Yourmapsnow.com via a software bundle, then you should also check your PC for malicious programs using an anti-malware scanner. Locate the unwanted application and Uninstall it. Locate the undesirable program and click Uninstall. Locate and Remove the undesirable software. Quick & tested solution for Yourmapsnow.com removal.